Perfect for a 3d village on a shelf. Can be lighted with a battery operated tea light. 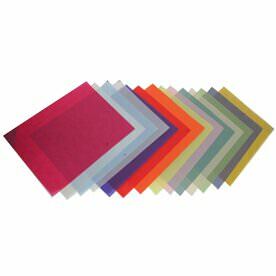 This design was adapted from a template on Little Glitter Houses. This building measures approximately 3" deep and 4.5" wide. 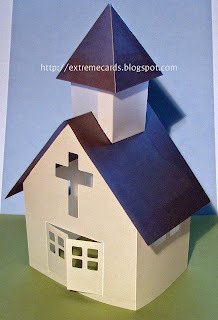 Adhere steeple into a box, and attach roof to steeple. Adhere steeple to church roof. The hole in the roof is to provide access to help you stick the tabs to the roof, and to allow light into the steeple from below. Attach church roof to the building. 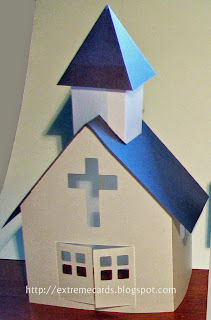 I used double sided tape to assemble the church.